You can slow down the effects of aging by paying attention to the foods you eat and how you eat them. Choosing the right kinds of foods, how you cook and eat them, and paying attention to the quantity and frequency of your eating, can greatly affect the aging process. Here are simple tips to remember when choosing the right kinds of foods for anti-aging. Have a well-balanced diet. Avoid too much salt, oil, and sugar. Use seasonings that have anti-aging properties. Garlic, ginger, chili peppers, cinnamon, lemon grass, and oregano, contain properties that have anti-aging effects. Eat dark green leafy vegetables. Leafy vegetables that are dark green are very nutritious and filling. Probably, they are the most concentrated source of nutrition of any foods. They are also cholesterol-free and fat-free. The reason why dark greens are more nutritious is simply because the dark leaves are able to absorb more light and synthesize more vitamins when they're still on the ground. 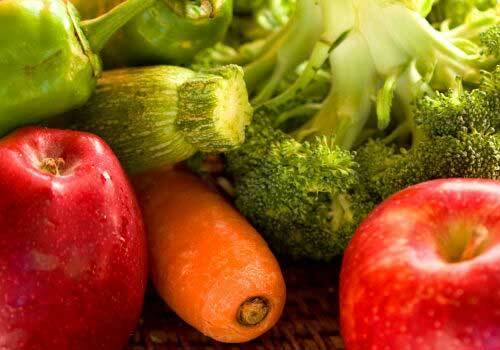 Vegetables contain large amount of water-soluble vitamins. These vitamins will easily deplete if the vegetables are washed in water for a long time. 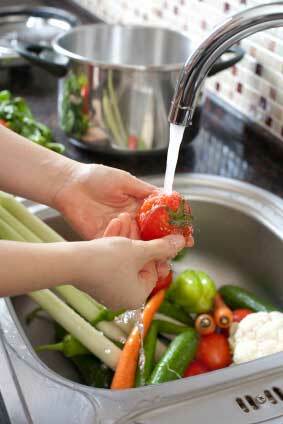 It is best to eat vegetables right after washing it sufficiently with water without heating. In this way, you will be able to retain most of its vitamins. 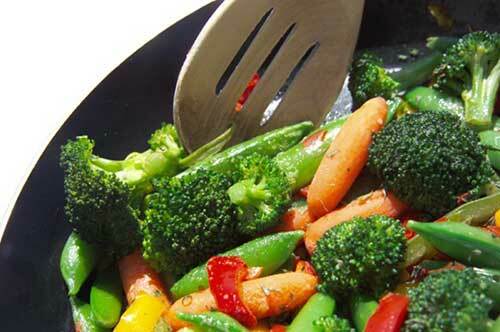 When frying vegetables, fat-soluble vitamins such as A, D, E and K are lost. To minimize this, always try to avoid deep-frying or fry for only a short time while using small amounts of olive oil or sesame oil. Frying or heating can destroy omega-3 fatty acids (DHA and EPA), too. To ensure that you are taking the most nutrients in foods, eating them raw, boiled, or steam, is always the best. If you heat your food for the first time, most of the bacteria are killed. However, when it cools down, the surviving bacteria can find excellent conditions to contaminate the food again. In other words, by repeated heating (either through frying, baking, microwave, etc. ), the bacteria present can multiply and proliferate into dangerous levels. Not only that, you degrade the quality of the foods and kill many more nutrients through repeated heating. You don't just eat foods the way you want it. You need to chew them well, too. Chewing well can be a good exercise and makes the jaw and muscles in your face stronger. It helps prevent facial sagging and the contours of your face will also look better. Parotin, which is an anti-aging hormone, is interjected with every bite we take. This anti-aging hormone is what gives firmness to our bones and skin. In other words, good chewers look younger, live longer, and heal faster. Chewing well will also promote the secretion of saliva, aiding our digestion and absorption. Remember, the digestion process starts immediately in the mouth, not in stomach! Chewing well and eating slowly will increase the absorption of nutrients. You will become more satisfied and feel full quicker by not eating in a hurry. 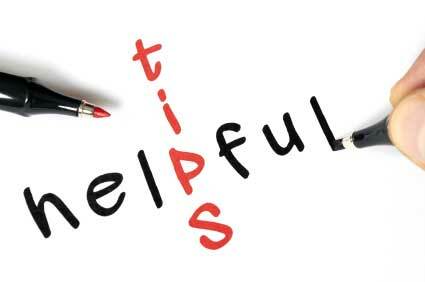 So if you are planning to reduce your weight, then this a great tip for you. We recommend that you take crunchy vegetables as the first thing that you eat before you begin your main meal. Also read article "A Great Tip to Help You Stop Overeating and Lose Weight"
Do not eat a lot of things during the first minute of your meal, especially sugary and fatty foods. This will help prevent raising your blood sugar level rapidly. Otherwise, this may quickly lead to obesity as we grow older. Refrain as much as possible to high-calorie softdrinks and alcohol. Avoid skipping meals. 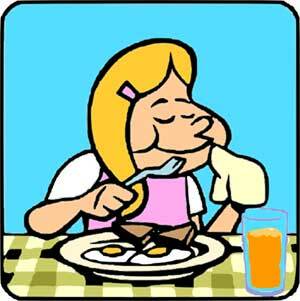 It is important to eat a meal three times a day: breakfast, lunch, and dinner. Avoid eating a lot in one meal and then not eating or eating less for the next 24 hours. Diabetes accelerates the aging of our bodies. The use of PYRO-ENERGEN therapy together with good eating habits will help you build the foundation of good general health.